GORDONVILLE — Heading into the 2013 NFL season, there wasn’t much talk about it lasting until 2014. Not for the Philadelphia Eagles. That was only for the few, the proud and those fortunate enough to catch breaks and avoid broken bones. After a two-year downhill slide into the abyss of the league’s landfill, there should have been modest expectations under first-year coach Chip Kelly. For starters, Kelly was coming out of the college ranks with new approaches voted by pundits as most likely to be boom-or-bust; revolutionary or revolting. And it was with a roster of players held over from a team that finished 4-12, a mark even worse than face value when one considers the team started off 3-1. The Eagles played it close to the vest in free agency, opting for some players salvaged from the league’s recycling bin. Some in Eagleville not only predicted another 4-12 year, they wanted one. The somewhat misguided thought being the team could use another high draft pick. But the empires that are NFL powerhouses – unlike in the NBA and NHL – aren’t built that way. It takes a village to win a Super Bowl, and one player doesn’t make a village. Most predictions ranged in the 6-10 to 8-8 range. It was believed that, if the NFC East didn’t have a dominant team, it was there for the taking with a mark above .500. But the reality was that this season was about changing the culture. The wins, likely in the second year of Kelly’s tenure, would follow. Lo and behold, they came a lot sooner. The Eagles were 1-3 after four games and 3-5 after eight before finishing on a 7-1 tear that concluded with that NFC East-clinching victory, down in Dallas, over a Cowboys’ team that entered the year with much higher expectations. After Brandon Boykin’s interception sealed the deal, and splattered egg whites on Jerry Jones’ face, the Eagles said all the right things about not being done. The reality, though, was that game was this year’s pinnacle. It was their Super Bowl. They won. An unlikely banner will join the others at Lincoln Financial Field, where the rabid fans would trade all the division and conference flags for a championship one. The Eagles took on the New Orleans Saints, just a few years removed from a Super Bowl title, in round one of the playoffs. The game was at the Linc and the Saints had never won a road playoff game – except the Super Bowl, of course – in their history. Didn’t matter. The Eagles fought back from a 20-7 deficit to take 24-23 lead, but lost on last-second field goal. But then the realization of all that was accomplished takes hold. The magical mystery tour lasting a bit longer would have been cool, but the reality is that this is not a Super Bowl team. But it was a playoff team, one that became relevant again. They were the talk of the league, stumbling upon a franchise quarterback (Nick Foles) who led the circuit in QB rating and a running back (LeSean McCoy) who led it in rushing. After the indignity of having no players make the Pro Bowl a year earlier, they had two (tackle Jason Peters and McCoy) make it this year. 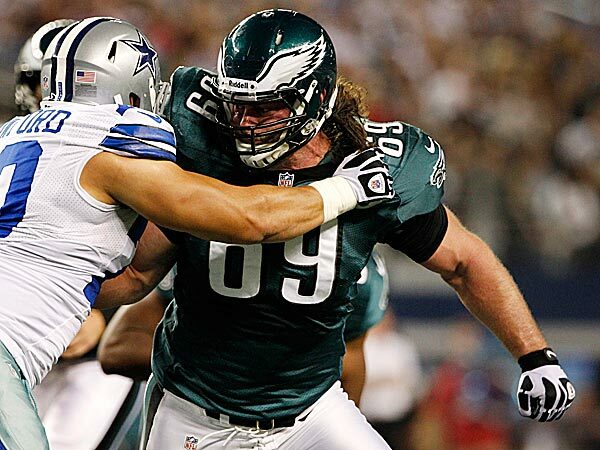 Three players (Peters, McCoy and guard Evan Mathis) were selected first-team All-Pro. Those were the types of things that used to ring hollow when Andy Reid’s Eagles repeatedly came up short of Super Bowl expectations, but they are indicators that we have been officially greeted by a new dawn. While presumptions that the Eagles have been cleared for takeoff to future Super Bowls might be premature, as the NFL graveyard is laden with cautionary tales of first-year coaches who never matched their rookie-year successes, there is a sense that this was more than happenstance. If the Eagles had gone 4-12, it would have raised more questions than answers. Instead, the players – from veterans to young bucks – bought what the coach was selling. Shortly after the loss to New Orleans, probably the best team the Eagles faced since getting pounded by Peyton Manning at the Denver Broncos in what seemed like a lifetime ago, owner Jeffrey Lurie put his hurt aside and placed the loss in the proper perspective. “When you make a coaching change, you have to transform to a new culture,” Lurie said. “These players and the coaching staff just formed an incredible bond, ability to prepare and an ability to win. That can take years, and they did it in six months. That is what is so great here. Some of that is spin, but most is truth. They say the truth hurts. This team – to borrow from John Mellencamp – made it hurt so good. This entry was posted in Sports on January 10, 2014 by gordonglantz.